The Anaheim Ducks travel to SAP Center to play the San Jose Sharks on Monday, April 16, 2018 in Game 2 of their 1st round series. The Sharks lead the series 2-0. The opening line for this game has the Ducks at +138 and the Sharks at -180. Anaheim had a record of 44-25-13 this season and on the road they had a record of 18-15-8-5. They were 2nd in the Pacific Division. They scored 235 goals and gave up 216 goals for a point differential of +19. For the season they have an ATS record of 44-40-0 and an over/under record of 32-50-0. San Jose was 45-27-10 including 25-13-3-1 at home this season. They finished 3rd in the Pacific Division. They scored 252 goals and surrendered 229 for a goal differential of +23. Their record against the spread is 47-37-0 while their over/under record is 37-44-0. Rickard Rakell has accumulated 69 total points this season for the Ducks. He has 34 goals this year with 230 shots on goal, giving him a shooting percentage of 15%. He has a total of 35 assists on the season and averages 19.4 minutes played per game. Ryan Getzlaf averages 21.4 minutes of ice time per game this year. In that time he has a shooting percentage of 9% by scoring 11 goals on 117 shots. He has 50 assists, giving him a total of 61 points on the season. John Gibson has 31 wins and 18 losses this season in net for the Ducks. He has 1,872 shots against him and he's given up 139 goals. He's made 1,733 saves for a save percentage of 93%. Brent Burns has scored 67 total points this year for the Sharks. He has 12 goals this season with 332 shots on goal, giving him a shooting percentage of 4%. He has a total of 55 assists on the season and averages 25.2 minutes played per game. Joe Pavelski averages 19.3 minutes of ice time per game. In that time he has a shooting percentage of 10% by scoring 22 goals on 224 shots. He has 44 assists, giving him a total of 66 points on the season. Martin Jones has 30 wins and 22 losses this year in goal for the Sharks. He has 1,699 shots against him and he's surrendered 145 goals. He's made 1,554 saves for a save percentage of 92%. The Ducks have 101 total points this season, which ranks them 8th in the NHL. They are 18th in the league in goals scored with 235 while they've given up 216 goals, ranking them 28th overall. They have had 214 power play opportunities and have scored 38 goals on those chances for a percentage of 18%. That is 23rd in the NHL. The Ducks have allowed 274 power play opportunities and have given up 46 goals on those chances for a penalty kill percentage of 83%, putting them 5th in the league when short-handed. They average 30 shots per game and as a team shoot 9.49% for the season. They allow 33 shots to their opposition per contest and have a team save percentage of 92%. That puts them 1st in the league in stopping the puck. The Sharks are 11th in the NHL with a total of 100 points this year. They have 53 power play goals on 257 opportunities for a percentage of 21%. That ranks them 16th in the league as a power play unit. They've allowed 224 power play opportunities and have given up 34 goals on those chances for a penalty kill percentage of 85%. That is 2nd in the NHL. As a team, the Sharks are 12th in the league with 252 goals scored while they've given up 229 goals, which is 23rd overall. They average 33 shots per contest and have a team shooting percentage of 9.33%. As a team they give up 30 shots per game and have a save percentage of 91%. That is 15th in the NHL. Anaheim is 24th in the NHL in Corsi percentage with 47.7%, as they've attempted 4,647 shots on net at full strength while they've given up 5,086 shots on net in the same situations. Their Fenwick percentage is 47.7% as they have 3,521 attempts while they have given up 3,853 shots on the defensive end. That ranks them 23rd in the league. The Ducks start possessions in the offensive zone 47.6% of the time, which is 28th in the league, while their defensive zone percentage is at 52.4% for the season. That is 3rd overall in the NHL. They have 2,499 face-off wins compared to 2,374 losses, meaning their face-off win percentage is 51.3%. That ranks them 8th in the league. 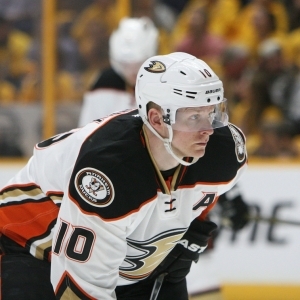 On defense Anaheim has 1,949 hits and they have blocked 1,233 shots from the opposition, putting them 11th overall. The Sharks are 12th in the league in starting possessions in the offensive zone, doing so 52.1% of the time. Their defensive zone percentage is at 47.9% for the season, which is 22nd in the NHL. They have 2,558 face-off wins compared to 2,433 losses, meaning their face-off win percentage is 51.3%. That is 11th in the league. On defense San Jose has 1,380 hits and they have blocked 1,381 shots from the opposition, which is 1st in the league. San Jose is 13th in the NHL in Corsi percentage with 50.8% as they've attempted 5,002 shots on net at full strength while they've given up 4,853 shots on net in the same situations. Their Fenwick percentage of 52.2% ranks 7th as they have 3,798 attempts while they have given up 3,472 shots on the defensive end. Who will win tonight's Ducks/Sharks NHL game against the spread?